In April 1918, Acting Lieutenant-Colonel Bowcher Clarke was commanding 4th Battalion, The Worcestershire Regiment, when the German attack in Flanders began. 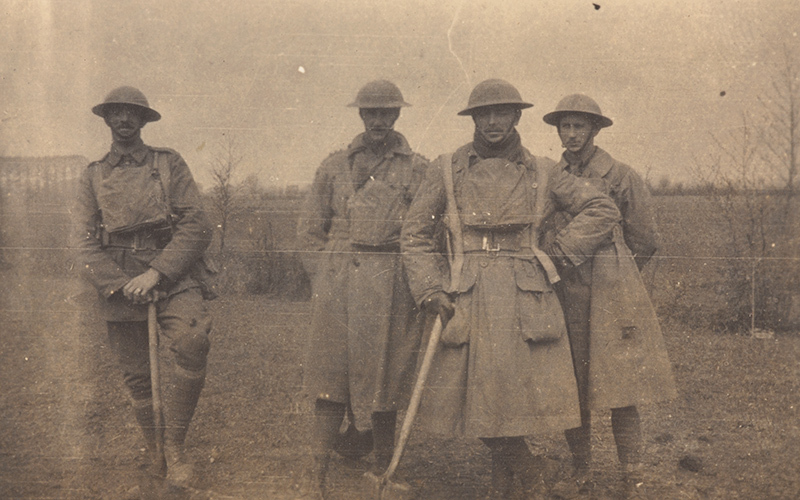 The photographs he took during this period of bitter fighting shed light on a struggle that helped decide the war on the Western Front. The German Spring Offensive of March 1918 made extensive gains along the Somme River region. But by the first week of April their advance began to run out of steam and they were held east of Amiens. The Germans now shifted their attention north to Flanders, with another offensive south of Ypres. The German offensive on the Lys: 4th Worcestershire Regiment holding positions at La Crêche, April 1918. Clarke’s caption notes that ‘the Germans are attacking at this moment’. Operation Georgette (or the Battle of the Lys, 7-29 April 1918) aimed to capture Ypres and the surrounding high ground around Messines. The Germans would then push the British back against their ports along the English Channel and force them into a corner. On 9 April 1918, following a two-day bombardment, 14 German divisions attacked the British First and Second Armies along a 10-mile (17 km) front. The River Lys formed a barrier between these two armies. As at the Somme, the ferocious German advance quickly drove the Allies back, punching a hole 3.5 miles (5.6 km) wide through their lines. The German storm troops were supported by ‘hurricane bombardments’ that included mustard and phosgene gas alongside high explosives. The attackers made quick work of a Portuguese division near Neuve Chapelle, sending four divisions against this single unit and taking over 6,000 prisoners. They advanced through the gap left by the Portuguese, but were eventually held up by the British 55th Division. Clarke’s battalion was in the line near Passchendaele with 29th Division when the attack commenced. 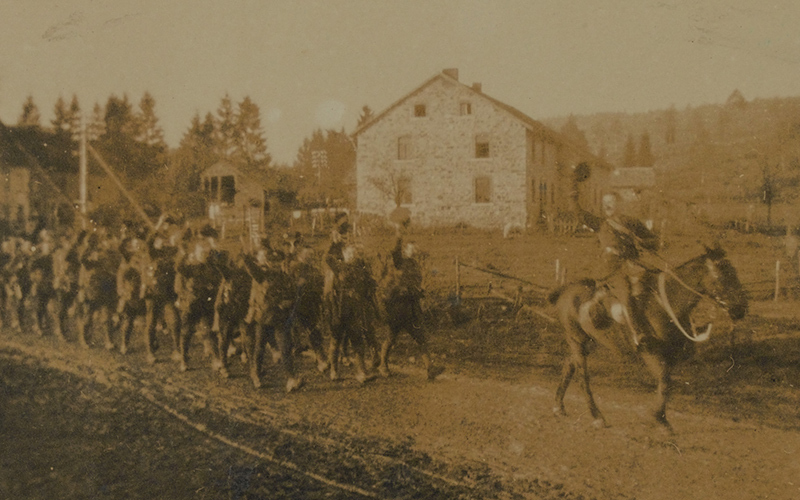 But on 9-10 April they were moved south by train and bus to new positions with 88th Brigade at La Crêche near Bailleul. Once there, the 4th Worcestershire held their ground stubbornly, helping to beat off successive attacks until relieved on 15 April. The line of trenches they occupied was part of the last prepared system of defence, and several of Clarke’s photographs show his men strengthening their makeshift positions during the breaks in the fighting. 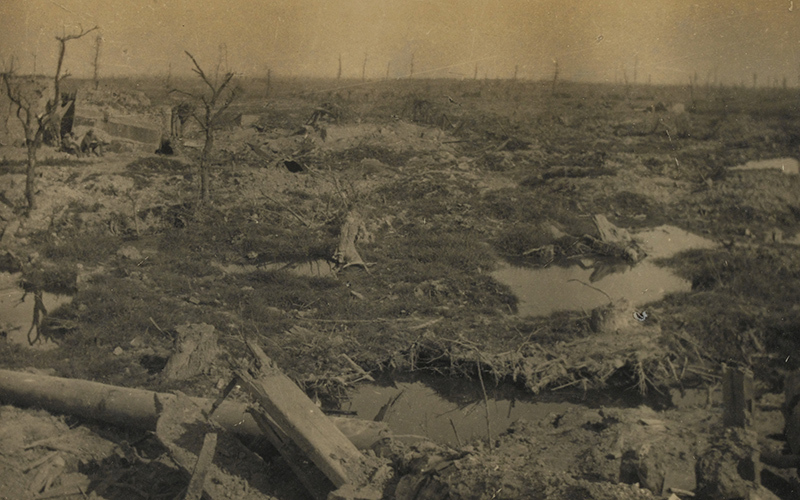 Another German attack on 10 April, to the north of Armentières, led to the capture of the Messines Ridge. Two days later they made a concerted attempt to capture Hazebrouk, a major Allied logistics centre. However, the 1st Australian Division halted the German drive against that town. The Germans threw in their available reserves and continued to advance, taking several key targets, including Bailleul and Mount Kemmel. But the attack started to stall with the arrival of French reinforcements. The British defensive positions were also better prepared and more tenacious than those at the Somme. As a result, the Germans had advanced only 7 miles (12 km) by the time General Erich Ludendorff closed down the operation on 29 April. The small gains had cost the Germans dearly in terms of men lost – around 109,000 soldiers killed, wounded or missing. Allied losses were even higher, but the arrival of thousands of American troops boosted their manpower. The Germans could not afford such losses despite men still arriving from the Eastern Front. They had used up most of their reserves in a last desperate effort to break the Allied line and gain the Channel ports. Bowcher Campbell Senhouse Clarke (1882-1969) was born in the Parish of St Stephen, Paddington, London, on 19 April 1882. He was the son of Colonel William Senhouse Clarke of the Worcestershire Regiment, and his wife Fannie Matilda Clarke (née Vance). After being educated at Wellington College and Sandhurst, Bowcher Clarke was gazetted as second lieutenant to the 4th (Militia) Battalion, The Worcestershire Regiment, in June 1899 and promoted to lieutenant the following year. In 1901, he went to South Africa during the Boer War (1899-1902), attached to the 5th Battalion, The Manchester Regiment. A few months later, he joined the Worcestershire Company of the 5th Mounted Infantry Regiment. This went on to operate in Cape Colony, Orange River Colony, the Transvaal and Griqualand. Clarke received a regular commission for his services in South Africa and joined the recently-raised 3rd Battalion of the Worcestershire Regiment at Tipperary in January 1903. 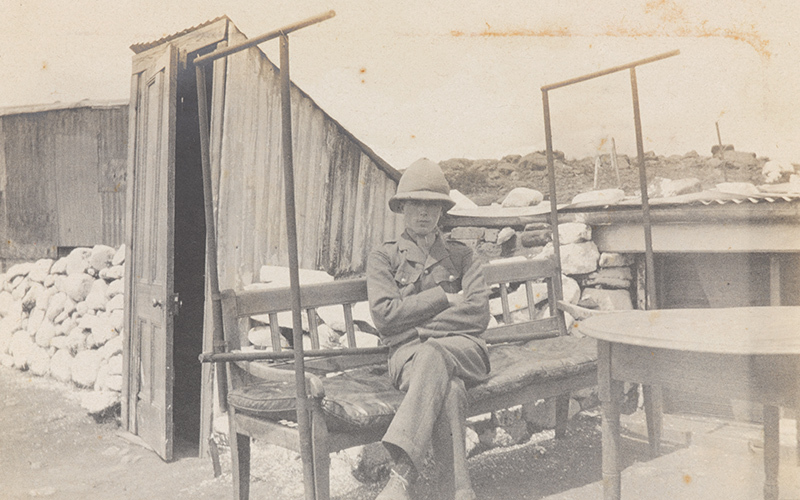 Later that year, he was posted to the 2nd Battalion and returned to South Africa before undertaking further regimental service in Ceylon and India. Clarke was promoted to lieutenant in 1906 and in 1912 he was appointed the 2nd Battalion’s adjutant. In 1913, he returned to England with the battalion. He was stationed at Aldershot until the outbreak of war in August 1914, when he proceeded to France. In September 1914, he was promoted captain. In October, he fought at the First Battle of Ypres (20 October – 22 November 1914). One of the key engagements during the fighting there was the Battle of Gheluvelt (29-31 October 1914), where Clarke helped lead the remnants of his battalion in their famous counter-attack that repelled a massed German assault. In February 1915, Clarke received a brevet-majority for distinguished service in the field, and was promoted to full major in May 1917. In November of that year, he was promoted acting lieutenant-colonel and assumed command of the 4th Battalion of the Worcestershire, then part of 29th Division. He remained in command of the 4th Worcestershire until September 1918, when he was invalided home, having fought in 18 major battles. For his war services Clarke was three times Mentioned in Despatches and awarded two Distinguished Service Orders. In 1919, he proceeded to Germany in command of the 53rd (Young Soldiers) Battalion, The South Wales Borderers, for the Army of the Rhine. He then served in Ireland before commanding the Worcestershire Regimental Depot from November 1923 to November 1926. Clarke later served in India, where he also undertook staff appointments at Meerut. Promoted to lieutenant-colonel in November 1929, Clarke commanded the 2nd Battalion in Plymouth and Malta. In 1934, he was appointed brigadier and given command of a Territorial Army brigade. During the 1930s, he resided at Fleetwood, Crowthorne, Berkshire, with his wife Margaret Isabel Clarke. After the outbreak of the Second World War in 1939, he took command of the North Aldershot District, but retired from active service in 1942. In 1945, he was appointed Colonel of the Worcestershire Regiment, holding this position until 1950. In later years, he was also vice-president and president of his regimental association. Brigadier Clarke died at Cheltenham on 16 January 1969. He is commemorated by a memorial plaque in St George’s Chapel at Worcester Cathedral.